The New York Times and USA Today bestelling series, with over two million copies in print! 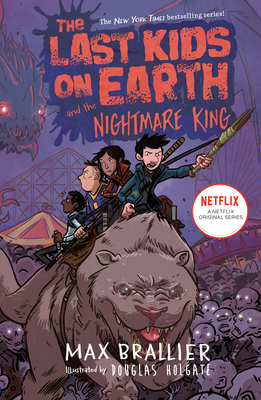 Life after the zombie apocalypse is pretty good for 13-year-old Jack Sullivan: he lives in a mind-clobberingly cool tree fort with his best friends, speeds through town playing Real-Life Mario Kart, has a crew of monster buddies, battles zombies on the regular, and generally treats life like it’s a videogame! But then Jack’s friends make a startling discovery: they may not be the last kids on earth, after all. This is great news for everyone… except Jack. Once they’ve found other humans, his friends won’t stick around for long! Jack’s only hope for keeping things the way they are is to prove that everything here is perfect, life is crazy fun, and nothing else could be any better. Max Brallier (maxbrallier.com) is the New York Times bestselling author of more than thirty books and games, including the Last Kids on Earth series. He writes both children’s books and adult books, including the Galactic Hot Dogs series and the pick-your-own-path adventure series Can YOU Survive the Zombie Apocalypse? He has written books for properties including Adventure Time, Regular Show, Steven Universe, Uncle Grandpa, and Poptropica. Under the pen name Jack Chabert, he is the creator and author of the Eerie Elementary series for Scholastic Books as well as the author of the New York Times bestelling graphic novel Poptropica: Book 1: Mystery of the Map. Previously, he worked in the marketing department at St. Martin’s Press. Max lives in New York with his wife, Alyse, who is way too good for him. His daughter, Lila, is simply the best. Follow Max on Twitter @MaxBrallier.